Volunteers Gaylene St. Leger Cox, Tiffany Pistole, and Sarah Stratton. 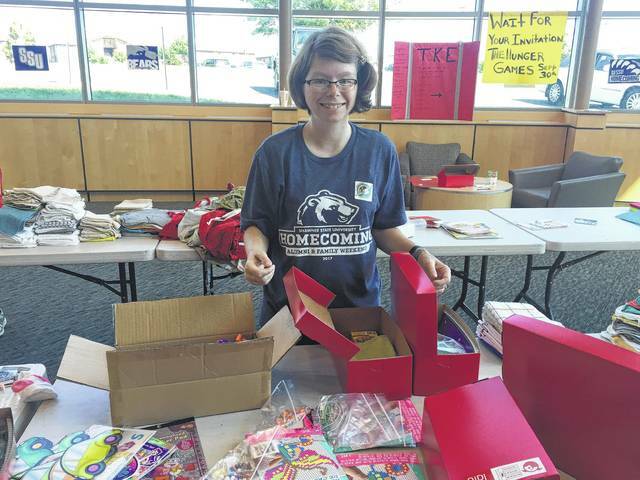 Shawnee State Student Sarah Stratton volunteers to pack boxes. 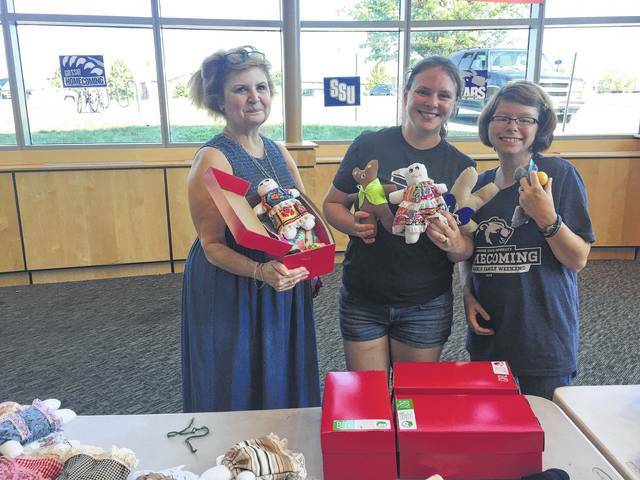 Volunteers with Operation Christmas Child gathered in the University Center on Shawnee State’s Campus Wednesday to assemble and fill boxes to be donated to children in need around the world. Year-Round Media Volunteer Tiffany Pistole, who has been involved with the charity for the past 11 years, believes the boxes are essential in the lives of needy children. Although the items included in the boxes are extremely useful to the recipients, Pistole feels like sometimes the simplest items make the biggest impact. “School supplies and hygiene items are very practical, but the items like dolls or stuffed animals become the children’s most prized possessions that bring color to a dark world,” said Pistole. Other volunteers also believe that the toys donated can sometimes make the largest impression on the children that receives them. “It helps children, and gives them a toy to sleep with a night. It’s the right thing to do,” said Volunteer Sharon Danzer. Gaylene St. Leger Cox, another Year-Round Media Volunteer, feels passionate about making a difference in the lives of children. The boxes are dispersed to the needy children by teams who work directly with people of each community to reach children in all corners of the world. “We have a national team and an international team that works hard to distribute the boxes to the children that need them. Some boxes travel by elephant, camel, and canoe to get to their destination,” said Pistole. Operation Christmas Child will be hosting their second packing event on Shawnee’s Campus in November. They are always looking for donations of shoeboxes, beanie babies, and other unwanted toys. National Collection week is Nov. 13-20 with the new donation drop being Temple Baptist Church.